Questions about transportation? The weekly menu? Or even laundry services in the dorm? 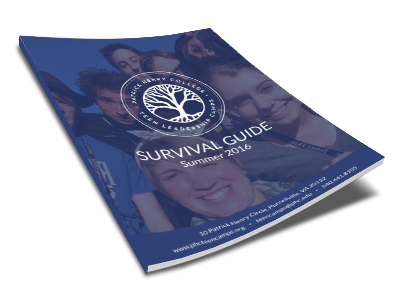 The Teen Camps Survival Guide is your key to understanding the essentials. Inside your free copy, you will also find the mission of Patrick Henry College and the vision behind camps itself. Click on the right to get your copy. Transportation is provided from Washington Dulles International Airport (IAD) only. This service is provided to students who have paid the $12 travel fee each way. See below for shuttles times. There are no exceptions to arrival and departure times. Campers who arrive at the airport after the last shuttle has left (5:00pm) due to unforeseen circumstances (e.g. flight delay) will be picked up by camp staff later in the evening. The camper should call the Director, Sarah Geesaman to notify her. Arrivals: The first shuttle arrives at IAD at 3:00pm Sunday and the final shuttle leaves the airport at 5:00pm Sunday. Counselors with a “PHC Teen Camp” sign and Teen Camps staff shirts will be waiting in the area of Baggage Claims 5, 6, and 7 to meet students. Departures: The first shuttle will arrive at IAD at 6:30am on Saturday and the last will arrive at 12:00pm. Unaccompanied Minors: If a camper is signed up for an airline's Unaccompanied Minor service, they must arrive during our shuttle times, and we must know in advance. Note on our travel form at registration if your student is signed up for an Unaccompanied Minor service. Airline policies require Teen Camp staff to sign paperwork stating that we have picked up the passenger and require us on departure to wait with the passenger at the gate until they have boarded the plane. Thus, the departure must occur prior to 12:00pm on Saturday so that our staff can return to campus on the last shuttle. Click here for the information airlines need on the counselor who will be picking up unaccompanied minors. Dinner for campers is only offered from 5:00-7:00pm. If you would like to take advantage of that, arrive earlier to ensure adequate time to settle in. All of these accommodations offer a discount to families visiting Patrick Henry College. Click HERE for printable lodging information. Personal toiletries, casual and dress clothes, towels, sleeping bag or linens, pillow, cell phone, camera, stationery, backpack, money for book store purchases and snacks, pencils/pens, notebook, and Bible. Come to all camps with a pair of comfortable walking shoes for field-trips and athletic shoes for sports and camp activities. Campers should come with bedding for their stay in the residence halls. Both sleeping bags and sheets are acceptable (the beds are XL twin-sized). Campers should bring pillows, towels and any personal toiletry items. 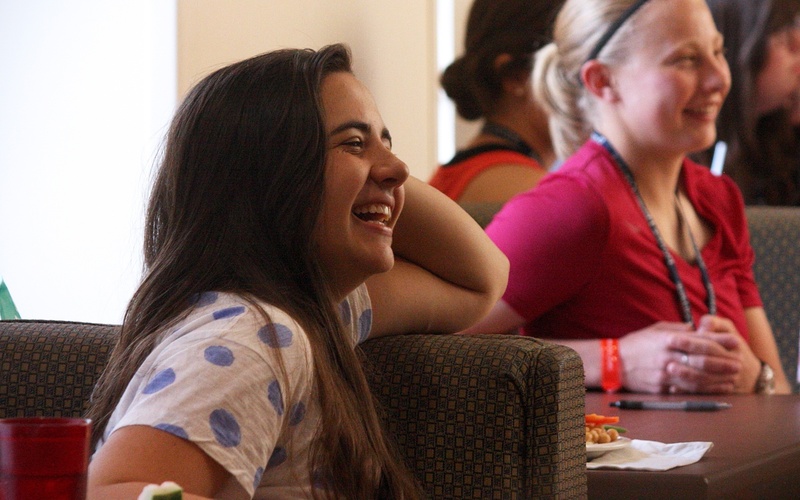 Casual clothing is appropriate for all regular, on-campus camp sessions. Most campers will wear jeans, shorts, t-shirts, or tank tops. While sandals or flip flops are certainly appropriate, please bring tennis shoes for sports and recreation activities. We expect all campers to respect a general modesty dress code at all times. Shorts should be no shorter than mid thigh; skirts and slits no shorter than two inches above the knee. Tank top straps should be at least two fingers in width. Please do not bring tops that are tight, see-through, low-cut, or reveal bare midriffs. Camps with a tournament or professional presentation at the end of camp will require business attire. If your camp is included in this you will be informed via email. The following schedule is a sample day in the life of a camper. Schedules vary according to the theme of the camp. 1 pm: Group Activities: break-out sessions, scenario briefings, special guest lecturers etc. Registration is 3:00pm – 5:00pm on Sunday. All campers must depart Saturday before 12:00pm. Registration is in the lobby of the Barbara Hodel Center (there will be signs and staff on hand to direct you upon your arrival to the College). At check-in, remaining camp balances should be paid via card or check; students will receive nametags, meal wrist-bands, and camp bags and T-shirts. You will meet the camp staff and can settle into your room, take the campus tour at 3:30pm, or enjoy some rec games before dinner at 5:00pm. 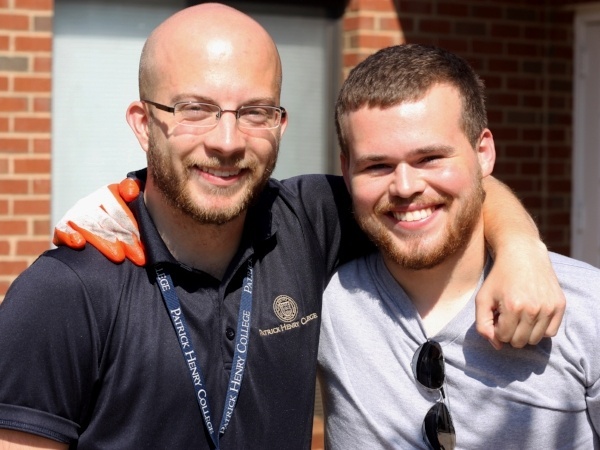 On the Sunday, when students are being dropped off for camp, there will be an Admissions Counselor on site to give a tour of the campus and sit down and answer any questions that parents or students may have about the college. If you would like to know more about Patrick Henry College, the Admissions Counselor would love to be of help in any way possible. The tour will begin at 3:30pm and last about an hour, and there will be time afterward to have any further questions answered. Please RSVP by noon of the Friday before the start of camp by adding it to your registration in your Active account or by emailing teencamps@phc.edu.